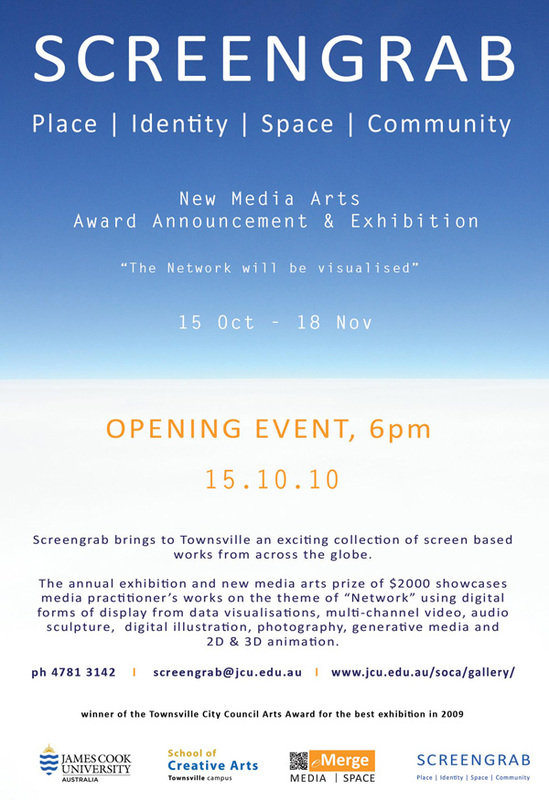 On Friday night (15.10.10) at James Cook University’s eMerge Media Space the 2010 winner of the Screengrab New Media Arts Award was announced ~ Italian artists, Juliana Gotilla and Izabel Rainer Harbach.The $2000 prize which is sponsored by the School of Creative Arts represents the Media Space’s premier exhibition for the calendar year and attracts a global roster of artists working within the fields of screen based media and electronic arts. The Italian duo’s video art piece, Fluid Network, captured the judge’s attention with its intriguing execution and quirky interpretation of this year’s theme – the Network.A strangely nostalgic construction, Fluid Network torments the viewer with the familiar sounds of network communication software – Skype, Instant Messenger apps, modems and ICQ chat alerts – as pools of liquid with an uncanny similarity to a map of the earth is slowly flooded by drops of water.It has to be seen – and heard – to be believed. Judges, Bernadette Ashley, Jak Henson and Dr Steven Campbell awarded this year’s prize to Gotilla and Harbach after a lengthy deliberation, considering the 17 works selected for display. The Screengrab exhibition will be on show at the School of Creative Art’s eMerge Media Space at James Cook University until Friday 19th November.Entry is free.